A brand new observation deck is just one of the options for scoping out the world-famous intersection from above. 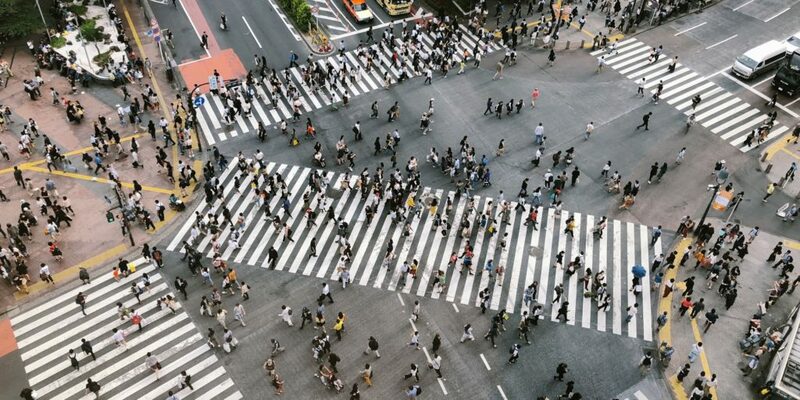 One of the best-known symbols of Tokyo is the busy pedestrian scramble outside Shibuya station. Virtually anyone who’s ever come to the capital has probably been drawn to it at some point. 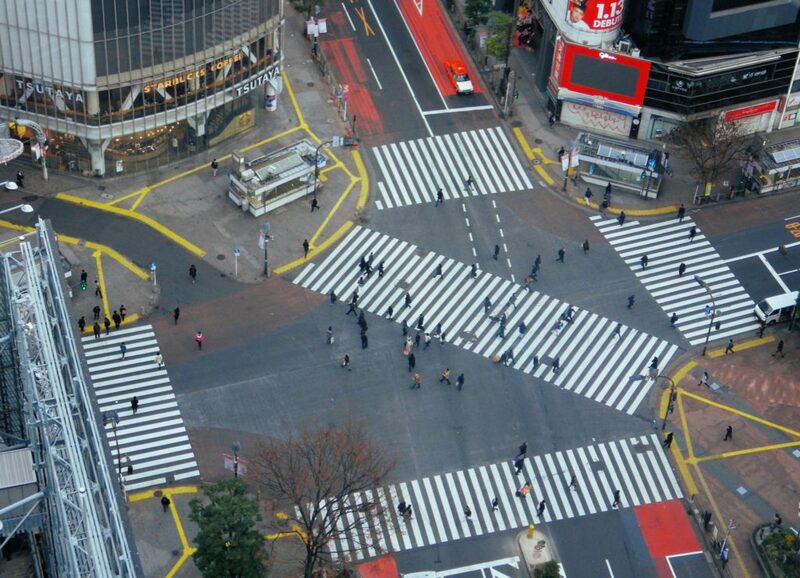 People refer to it variously as Hachiko Crossing, Shibuya Crossing or the Shibuya Scramble. Whatever you want to call it (for the sake of convenience, we’ll follow the example of local businesses here and call it the Scramble), it’s a true tourist magnet. The chaotic free-for-all of foot traffic, with people zigzagging every which way to get across the street, almost seems tailor-made to form an establishing shot of the metropolis on film. 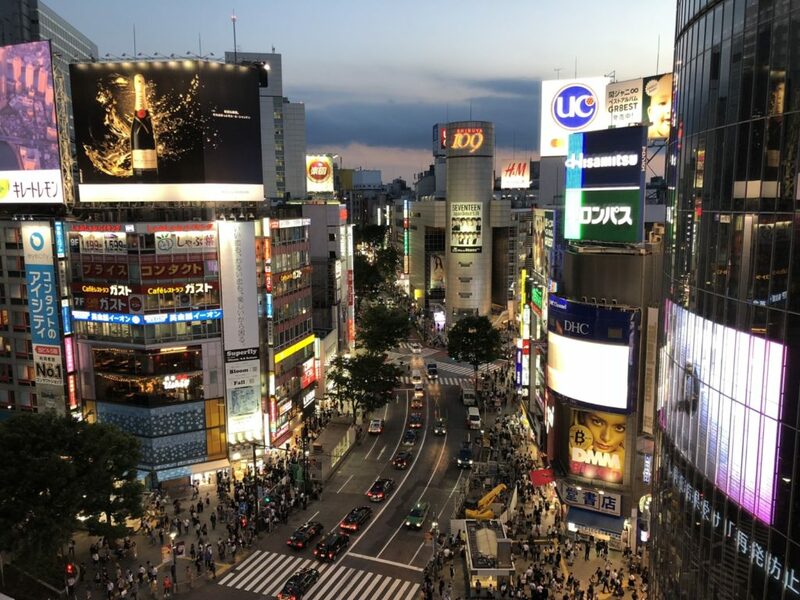 In our Lost in Translation guide to Tokyo, we looked at one well-worn spot for watching the Scramble: namely, the second floor of the Starbucks in Shibuya’s Q-Front building. To encourage a high turnaround of customers, the ubiquitous coffee chain only serves “Tall” size drinks at this location. 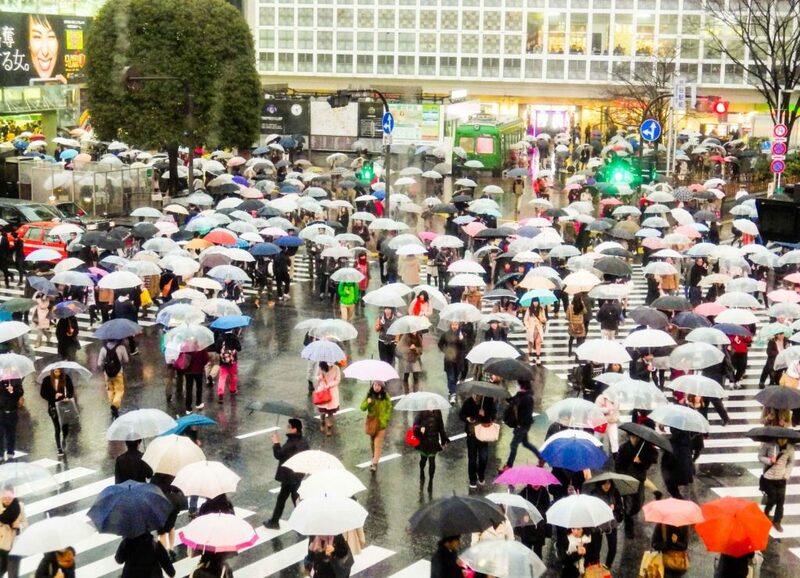 People crossing the Shibuya Scramble with umbrellas in the rain, as seen in Lost in Translation. This is one of the busiest Starbucks franchises in the world, with a view that overlooks the second busiest train station in the world. With every over-caffeinated shutterbug and their grandmother vying for a window seat, however, the place is already crawling with camera buzzards and it isn’t always the most relaxing nor even the best spot for watching the intersection anymore. 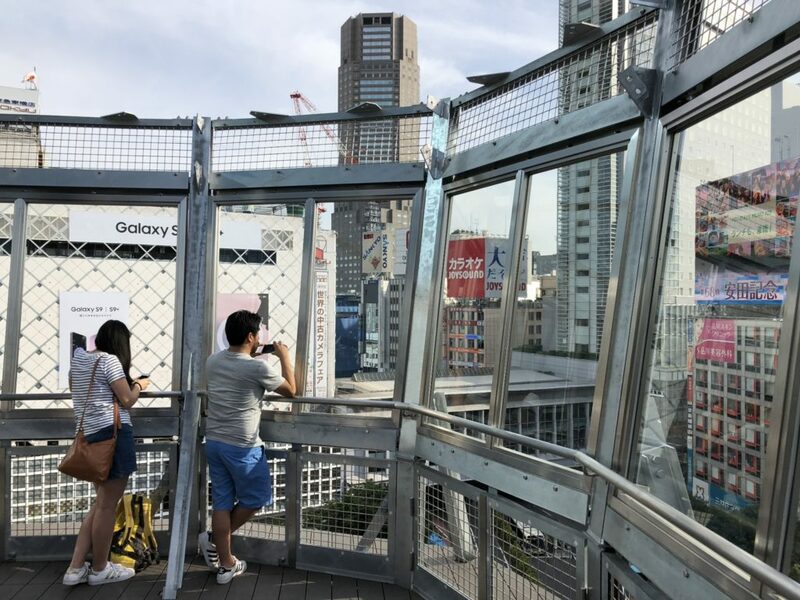 A new, open-air observation deck is just one of the lesser-known alternatives that will allow you to get a bird’s-view of the Shibuya Scramble. Here are a some of the non-Starbucks places you can go. Looking out from the new Magnet by 109 Crossing View at twilight. A familiar sight to Tokyoites and tourists is the landmark of Shibuya 109, the department store housed in a tall, cylindrical structure on the corner between Dogenzaka and Bunkamura Street. Until recently, the 109 Men’s branch sat in a separate building that was directly adjacent to the Scramble. Now that building is undergoing a renewal and re-branding as Magnet by Shibuya 109. On the seventh floor, you can take the XXXL eating challenge at Japan’s first Fatburger. The popular L.A.-based chain will add you to its wall of fame if you can finish its U.S. Kingburger: basically, two triple cheeseburgers stacked together for a grand total of six patties under one bun. Other restaurants on the same floor include Onigiri Bar, which serves Spam onigiri (Japanese rice balls). If you don’t have the appetite for such novelty food, you can always just skip straight to the rooftop of Mag’s Park. Follow the signs to the door where an outside staircase leads up to the roof. 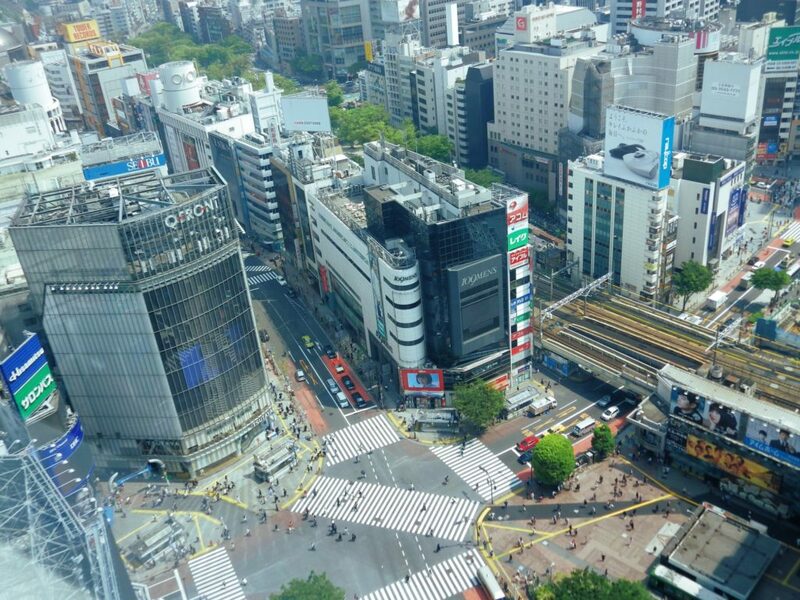 There you will find Crossing View, the new open-air observation deck overlooking the Shibuya Scramble. The rooftop and its hip, graffiti-tagged walls double as an event space; you’ll need to cut through tables and chairs to access the observation deck. Crossing View, the new open-air observation deck overlooking the Shibuya Scramble. Crossing View opened right before Golden Week this year, on April 28, 2018. While it was initially unmanned and free to access, it posted some fluid hours in the month of May due to event bookings and rainy weather. It was often tricky to catch it at a time when it was actually open, but as of June, there are now staff members working the ticket machines outside and it seems to be running more regular hours. This is where you can see the view in the main photo at the very top of this page. 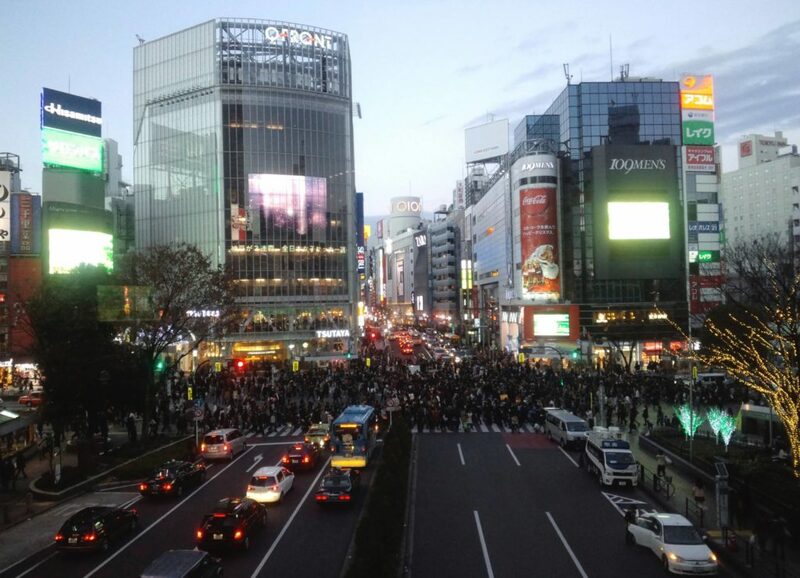 It’s currently the best place in Shibuya to get an aerial view of the Scramble. Table-side view from the Shunsai restaurant at the top of Shibuya Excel Hotel Tokyu. One of the best-kept secrets for aspiring Scramble birds might be Shunsai, the Japanese restaurant high up on the Shibuya Excel Hotel Tokyu’s 25th floor. If you get a window table on the far right corner at Shunsai, you should have a good view of the Scramble down below. The restaurant serves kaiseki meals, comprised of numerous small dishes served on one individual tray. Reservations are available for lunch and dinner; breakfast is first-come, first-serve. Where Starbucks has this restaurant beat is in the affordability department. The two cheapest options at Shunsai are the Japanese breakfast (¥2,851) and the bento box lunch (¥2,900). Dinner is upwards of ¥6,500. View of the Scramble from Shunsai restaurant. Having said that, Shunsai allows you to get a better view of the Scramble’s layout as a whole and its atmosphere is generally much more serene and enjoyable than Starbucks. Other options in the hotel building are the Estacion Café down on the fifth floor (though not the best pictures from this vantage point, since the view is partially obstructed) and the French restaurant A Bientot, which is located across from Shunsai on the 25th floor. 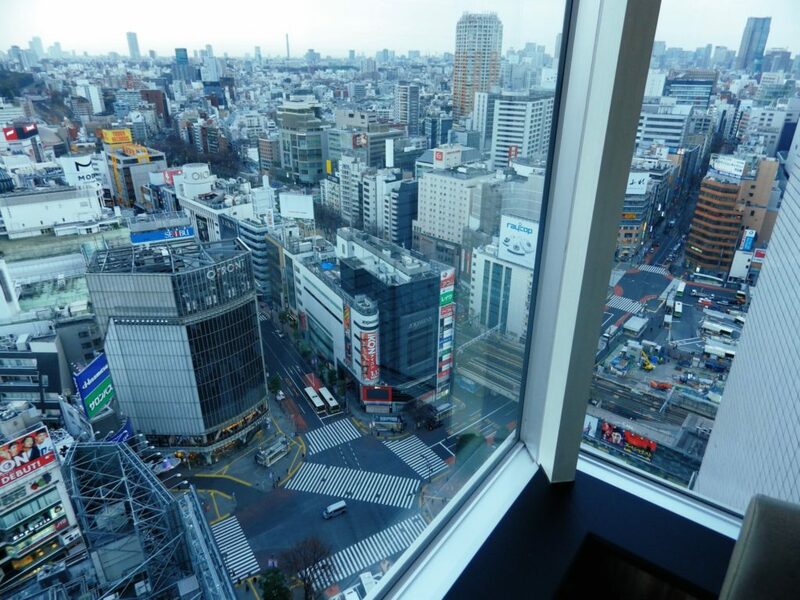 View from the elevator lobby on the 25th floor of Shibuya Excel Hotel Tokyu. The elevator to the 25th floor is only for guests, but A Bientot serves a Western-style breakfast buffet in the morning and if you’re eating there, you can probably snag some Scramble photos from the window near the elevator. When all else fails, you could always splurge on a room at the hotel and request one with a view of the Scramble. The view from the L'Occitane cafe. A 2016 article on our sister site, Savvy Tokyo, called Shibuya’s L’Occitane Café an “organic treat for the senses.” Even if you’re not one to normally seek out organic options, you may be won over by the stunning presentation of food at this café. 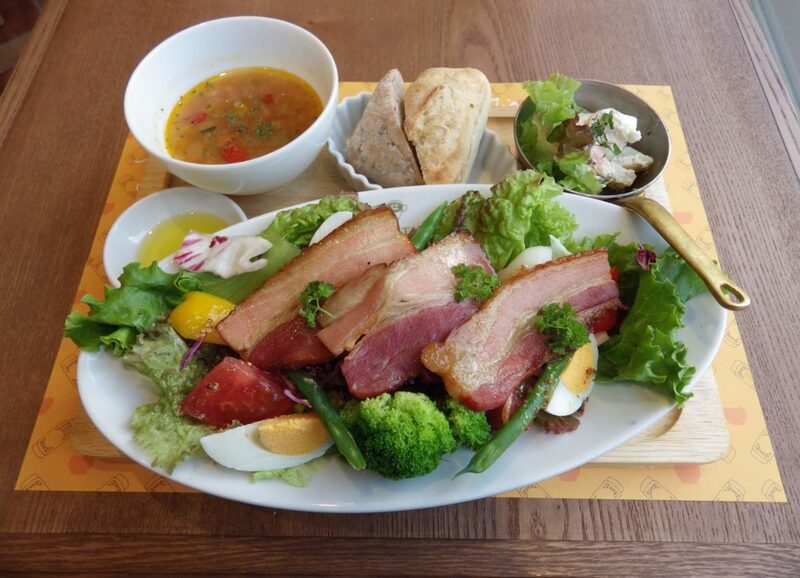 Anecdotally, one of my chillest Shibuya summer memories is saddling up next to a window at L’Occitane Café to eat a delicious salad topped with roasted bacon and spring vegetables. A summer salad, soup, and bread set at L'Occitane Cafe Shibuya. The café is closed for renewal right now, but it will reopen in late July 2018 and when it does, you better believe I’ll be there with a bib on my collar and a salad fork in hand. Though the view is partially obstructed by trees, L’Occitane Café Shibuya holds second- and third-floor window tables that do allow you to watch the flood of pedestrians on one side of the Scramble. Mark your calendars now for July. 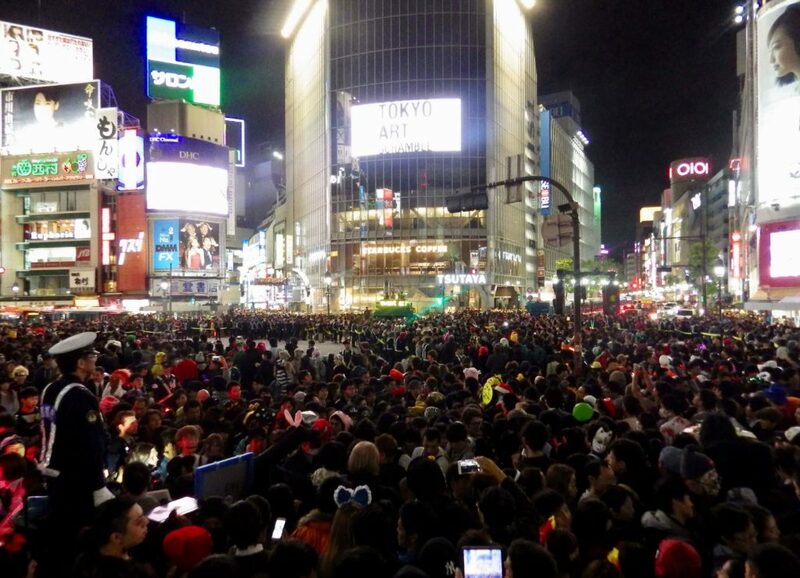 The Shibuya Scramble on Halloween night. When the Shibuya Scramble is especially crowded, like on Halloween night when the annual street party is happening, photographers often climb up on the bronze statue of 地球のうえに あそぶこどもたち (“Children playing on the earth”). This statue caps off what used to be a raised bush enclosure extending out from behind the other, more famous, meeting-spot statue of Hachiko the dog. Unbeknownst to many tourists, the bushes behind Hachiko used to be crawling with rats. You could sometimes see the rats rifling through plastic bags that litterers had left in the bushes. 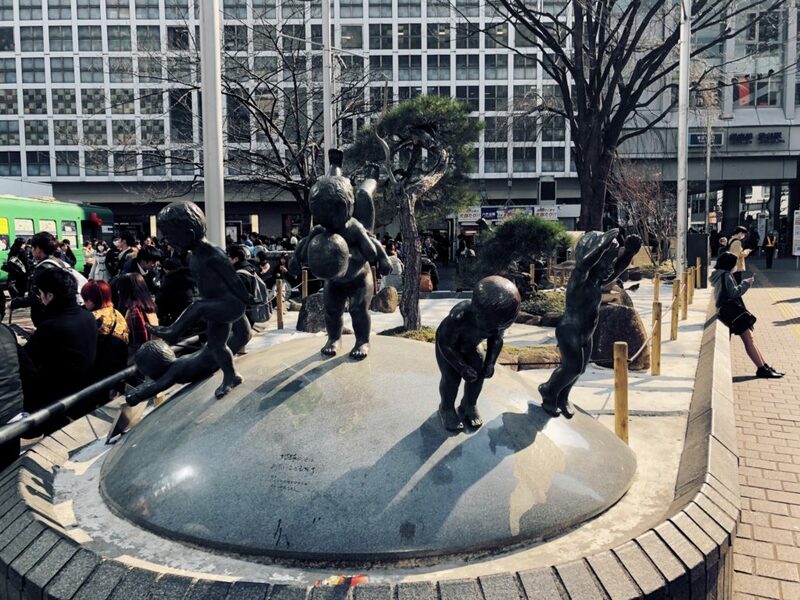 'Children playing on the earth' ground cover cap near Hachiko. Owing to this, perhaps, the ground in the bush enclosure has since seen a pavement “lid” of sorts placed over it. So now you can climb up there on Halloween night without having to worry about rats nibbling at your ankles. You’ll be sharing roughly the same eye level as the “DJ cops” doing crowd control from the top of their police vans. This vantage point is more akin to that of a bird perched on a branch than a bird high in the sky. 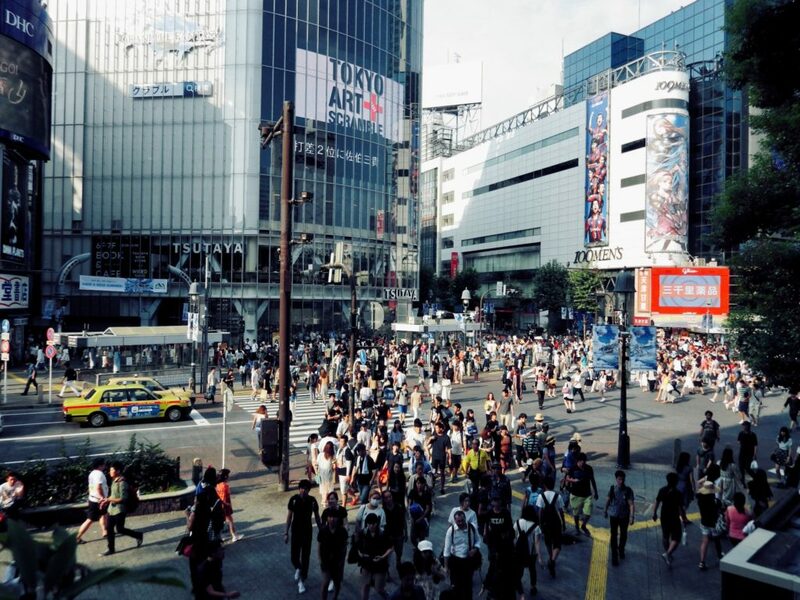 View of the Scramble from the Shibuya Mark City concourse. In Shibuya station, the concourse that leads to the Keio Inokashira line and Shibuya Mark City usually has some picture-takers gathering at its windows. These windows are lined with mesh, but if you’re using a smartphone camera, the lens should be small enough to aim between the mesh and fire off a few snapshots of Q-Front and the Scramble from afar. 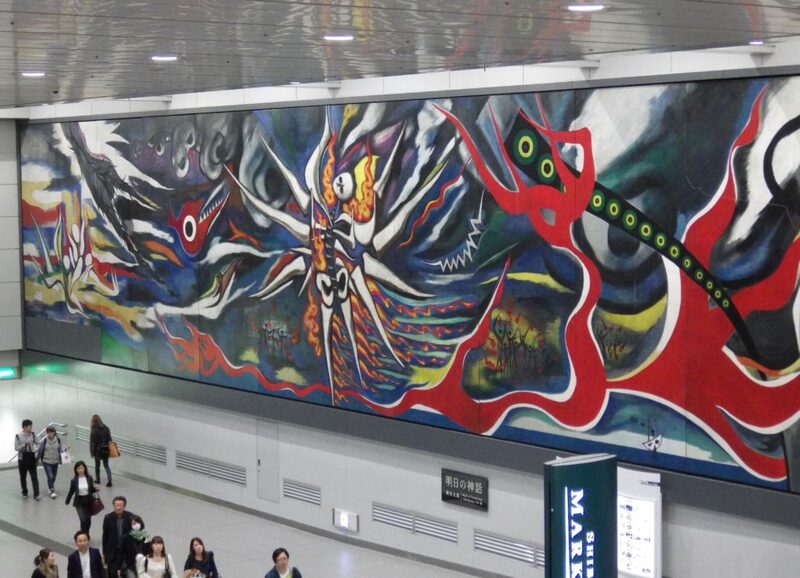 Taro Okamoto's mural 'The Myth of Tomorrow' in Shibuya station. When you’re finished, you can turn around and shoot some pictures of Taro Okamoto’s massive mural “The Myth of Tomorrow” on the opposite side of the concourse. Or you can re-enter the sea of commuters and catch a train to Kichijoji or Inokashira Park. A new 230-meter skyscraper under construction beside Shibuya station. Shibuya station currently has a number of new skyscrapers popping up around it. The area is in the middle of a huge redevelopment project, so these days half-finished high rises and construction cranes are a common sight. In September of this year, a new riverside complex called Shibuya Stream will open. In 2019, another new 230-meter skyscraper is also scheduled for completion. 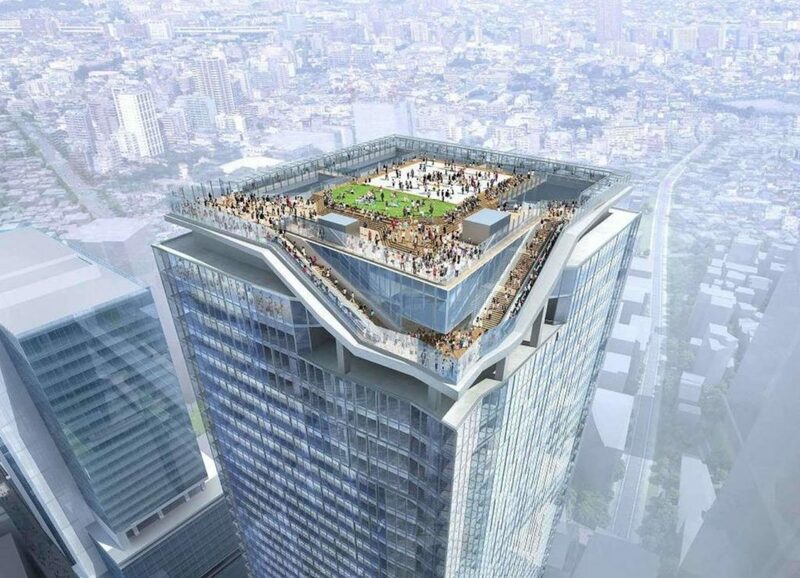 This one will be directly connected to Shibuya station and have an observation deck on top of it with a view that encompasses other parts of Tokyo like Shinjuku. On a clear day, you should even be able to see as far away as Mt. Fuji. Concept art showing the design of Shibuya's 230-meter observation deck. One thing’s for sure: the days of Starbucks holding a monopoly on views of the Scramble are swiftly passing out of memory. 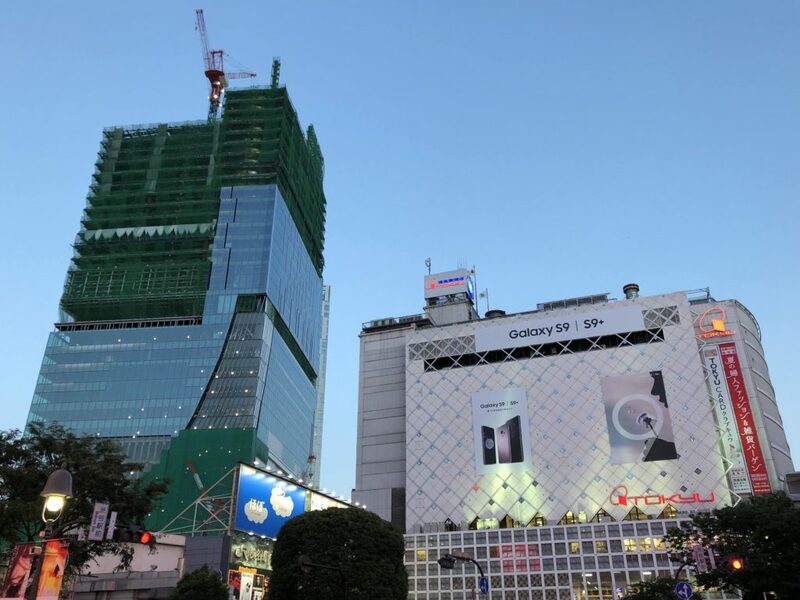 Have you checked out the Magnet building yet and are you excited about the new 230-meter observation deck coming to Shibuya next year? Do you know any other good lookout points for watching the Scramble? Share your own tips with readers in the comments! 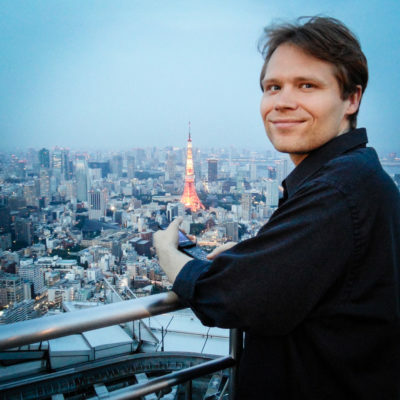 Writer in Tokyo who blogs about travel, film and literature. 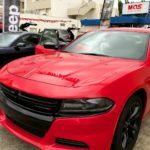 If you like the sound of being your own boss while supporting those who serve, check out this little-known, high-income position on US military bases in Japan. 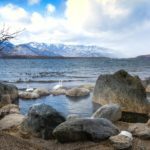 Hokkaido is an island blessed with an abundance of natural goodies like seafood, snow sports — and skinny dipping with friends! As Japan's Samurai Blue head to the FIFA World Cup once again, here's how you, your school and your community can use its teaching moments and be a part of the action.